One of the interesting aspects of stamp collecting is learning the history behind a particular issue. On June 22, 1897, the British Empire celebrated Queen Victoria’s Diamond Jubilee (Queen Victoria ruled for 64 years, from her ascension in 1837 until her death in 1901). A holiday was declared in Britain and its colonies for the major event. A series of stamps was also issued for the occasion. What makes the 16 stamps set from the Canadian Diamond Jubilee issue so popular (Unitrade 2009 #50-#65)? Obviously the Diamond Jubilee itself held a lot of interest for people. It’s not every day that a monarch succeeds in being on the throne for more than sixty years, in fact the longest reign up to that date had been that of George III. Victoria’s reign was a noteworthy one also for all the changes which took place in England during those years. While Victoria was a conservative woman who took pride in her role as a wife and mother and encouraged other woman to do so, her reign took place during the height of the Industrial Revolution. The «Victoria Years» were marked by great accomplishments in the fields of industrial, political, social, economic and military reform. She is known for her long self-imposed mourning period. So devastated was she by the death of her husband that she stayed secluded from the public for more than 40 years, and when she would make an appearance it was always in mourning black. Victoria even had Londoners paint the arrowheads topping their iron fence posts black, which they remain to this day even though previously they were noted for their many colours. 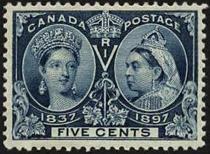 The Diamond Jubilee stamps are the first commemorative stamps which Canada issued. 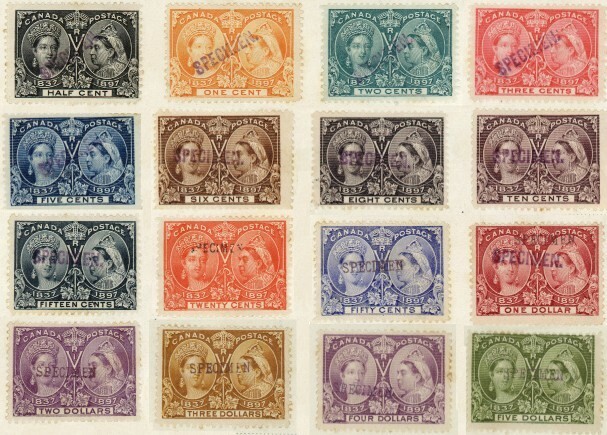 The are beautiful to look at, featuring a double portrait of Victoria. 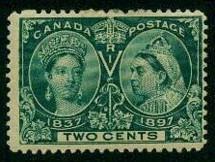 On one side the stamp portrays the young woman, and on the other the mature Queen. There are sixteen different denominations on the sixteen stamps, going all the way up to $5 which was an astronomical amount for its day and one which few people could afford. As a result, the $1 – $5 issues were printed in very few quantities. It has been stated that few of the $4 issue were ever sold, making it rare to this day. According the the Unitrade Specialized Catalogue of Canadian Stamps 2009, a complete set of Canada Diamond Jubilee stamps in mint very fine never hinged condition has a catalogue value of $34, 470.00!